In this challenging presentation, John Bevere warns that many Christians miss their destiny in God through wrong life choices. Learn how to cooperate with God's call on your life, and make choices today that will lead to a truly blessed eternity. 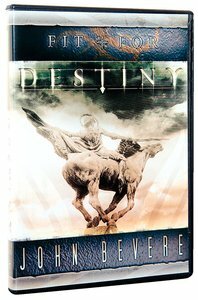 Customer Reviews For "Fit For Destiny"
John Bevere talks from Matthew 22:14 where is says "Many are called but few are chosen" he speaks about how it is not where we will spend eternity but how! He also speaks on how we will be judged not for what we do on earth but whether we do what God has called us to do! I highly recommend this DVD for either yourself or your church!